I said I wouldn't do this! I said I was finished last Thursday! Then I looked at my gift list. Grandkids and one daughter were giftless. After the Christmas pageant with 2 grandkids, I stopped at JoAnn Fabrics. I knew they carried Patons SWS with stripes and I had one ball in my stash. That's why I started the mitts in the last post. 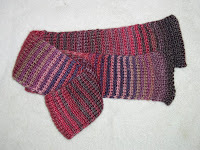 The scarf was finished Tuesday. I can see why everyone is knitting this pattern. I might do another one with more contrast. That really finished the knitting. 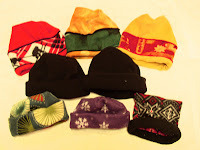 In the last 2 days, I have sewn 8 fleece hats for grandkids. The hats that were mailed arrived in Illinois today. At work, I'm working on a special Tallis for a customer. She painted images on silk. I get to sew them to a length of silk and put buttonholes in the corners for the special knots. I'll get photos when I work on it next time. This will be a quiet holiday for the two of us this year. Family festivities are on Friday at our son's house.